D.L. 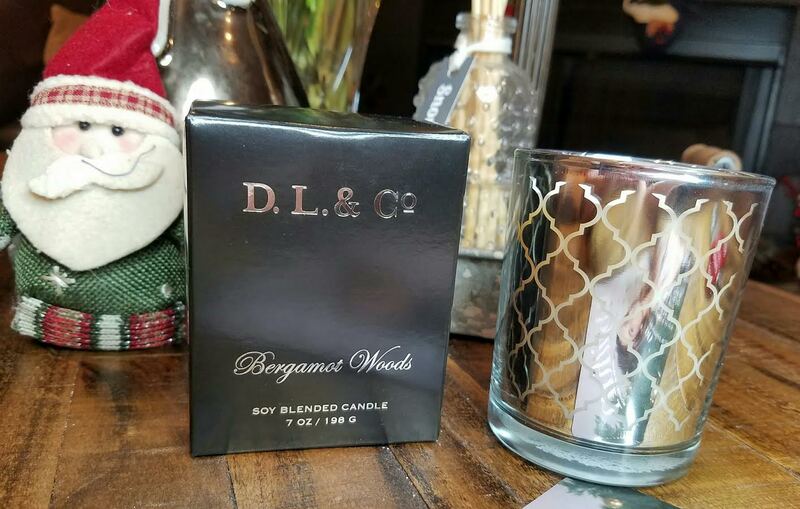 & Co. Candle in Bergamot Woods- I kinda wish I'd got the Blackberry Nectar scent but this one is very appropriate to the time of year. I love to have my house smell like a spicy pine forest during the winter. Especially because our tree is fake. I would rather have a real one but it's so much trouble for just the two of us. If we had kids, it would be real. This candle is in a gorgeous glass jar and I'm definitely using it for something else once it's been used. Or I could make another batch of candles and put them in it. Hm. Anderson Lilley Beach Butter Body Cream- Well, it's a little weird to get a beach scented lotion at Christmas. You'd think they'd pick something a little more in tune with the weather and season but whatever. It's made with shea butter and scented with Bergamot, citrus, white jasmine, Brazilian soft woods, heliotrope and musk. O.R.G. Skincare Mineral Face Peel- Don't worry, you're not actually peeling bits of your face off with this product. Apply a thin layer, let it dry then rub it off. As much as they may want you to think all that is your dead skin, it's just the result of the polymers in the recipe. Will it clean your face, though? Yes, it will. Is it fun? Definitely! Butter London Iconoclast Mascara- I think I've mainly used Butter London for lipstick and nail polish so this mascara is new to me. I adore their polish and lipsticks so I hope this fares just as well. 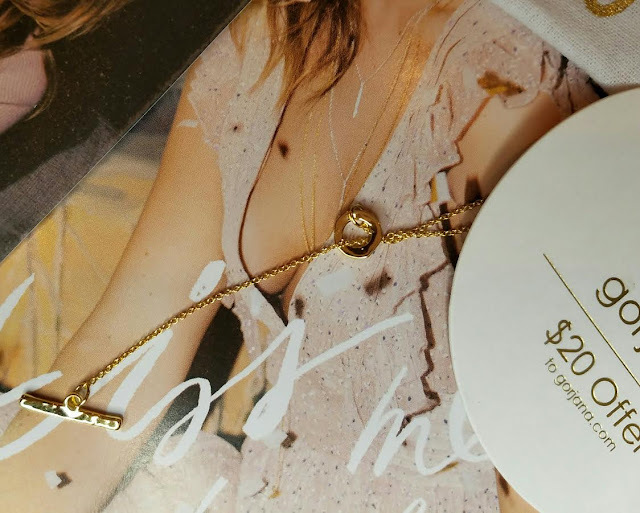 Gorjana Taner Toggle Lariat Necklace- I'm not quite sure what I think about this one yet. It's 32" from end to end and has am 18k gold fill chain with an 18k gold plated brass toggle. It's not really my style but we will see what I can do with it. Oh, darn! I see there are two options! I got the gold one. Poo. The silver one is more my style for sure. I wonder if someone will swap. 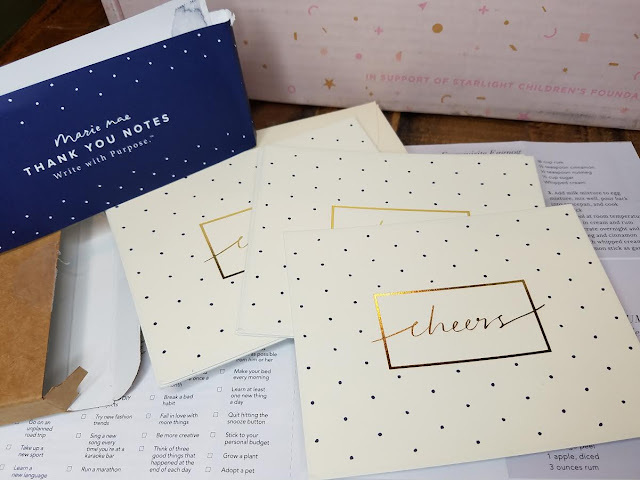 Marie Mae Company Thank You Card Set- This doesn't say thank you on it, it says "Cheers" (obviously) so I don't think I would use it for thank you notes. More for "hey, how are you doing, what's going on in your life" type notes. :) I love these and think they're beautiful! 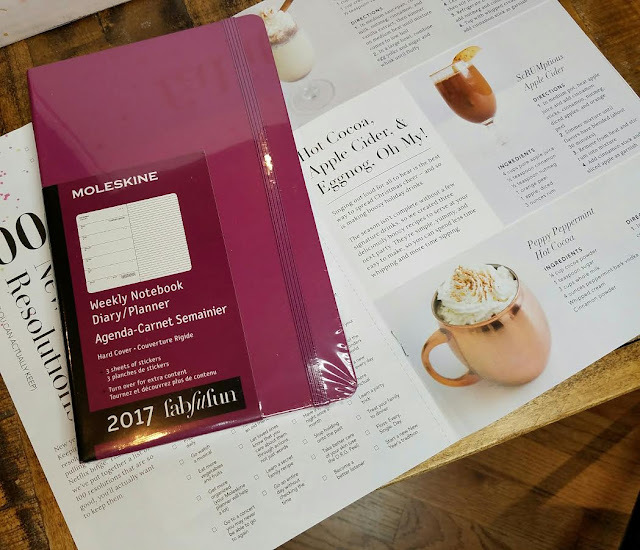 Moleskine 2017 Weekly Planner- One thing I learned last year, after I bought an expensive Erin Condrin planner was that planners don't work for me. The only thing that works for me is a big desk calendar that I can write on and keep on my desk, right in front of me. Otherwise... the planner just gets stuck somewhere and forgotten. Kiiiind of an expensive way to discover that but now I know. This will have to go to someone much more organized than me, that's for sure! VERDICT: I really enjoyed this box. I think it's been awhile since I've like one as much as I do. Everything in this is useful for myself or for gifts and I'll hopefully be able to swap for the variations I would have liked to have received. 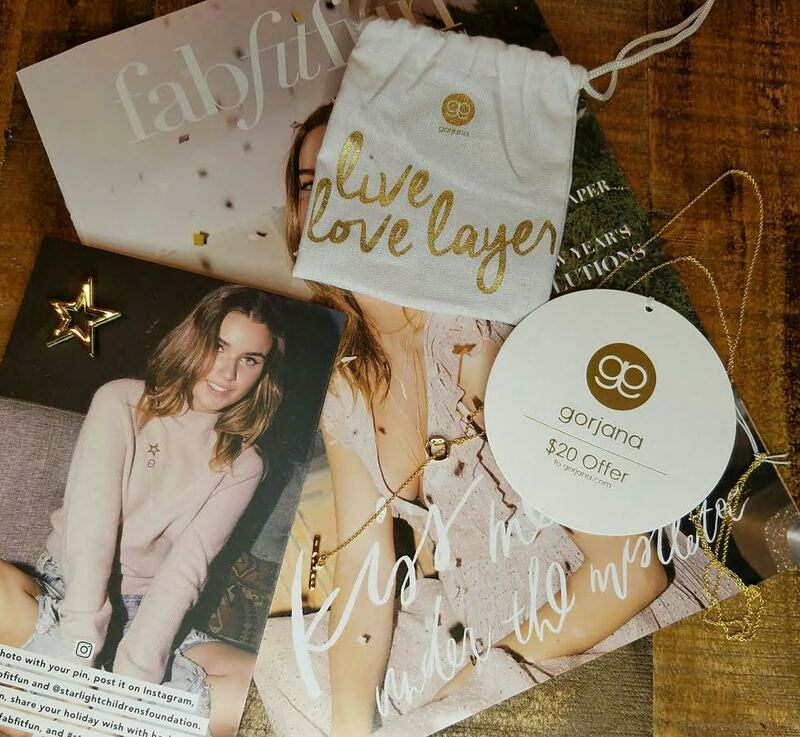 It's definitely worth it's full price, especially considering the Gorjana necklace alone is worth $75. If you'd like to sign up for Fabfitfun, you can do that here. Use code FAB10 to get $10 off your first box. 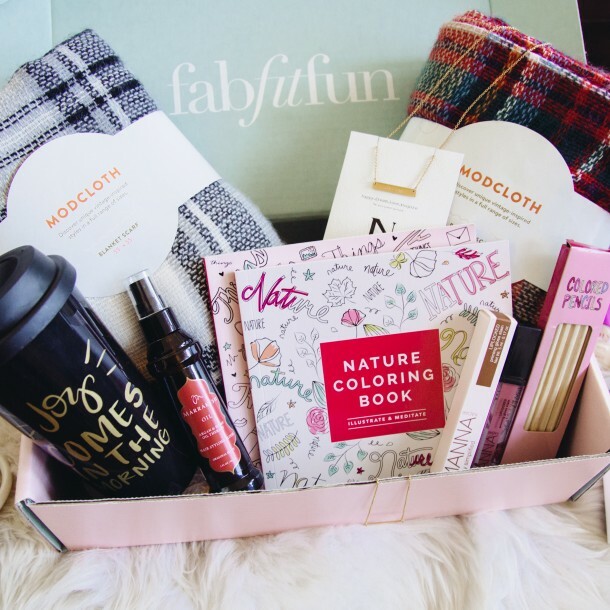 This particular Winter Box is sold out. 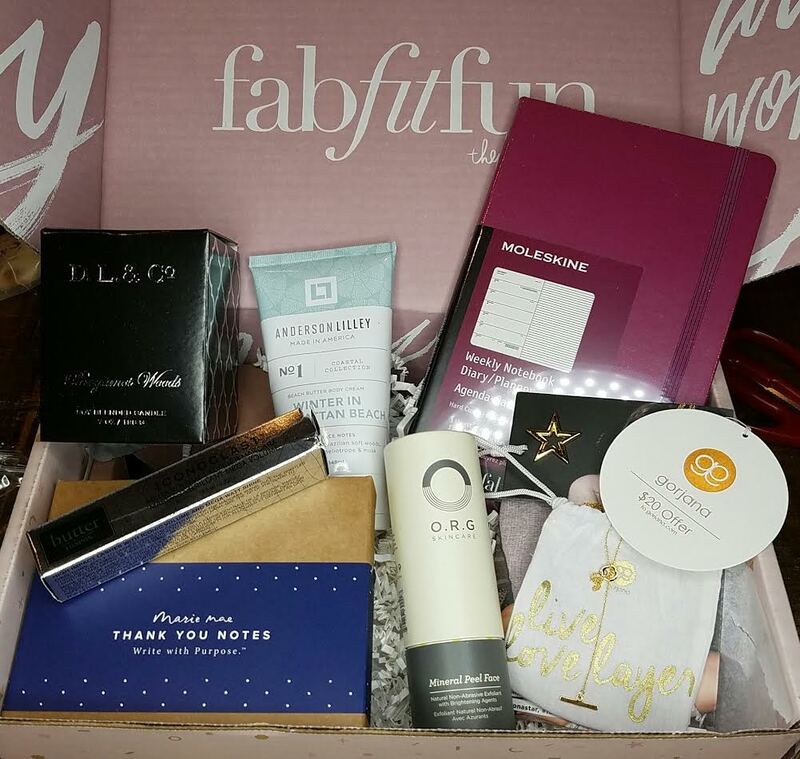 If you sign up now, you will get the Editor's Box which is packed with favorites from older boxes. Some really great stuff in the Editor's Box this time around. Definitely worth the cost, I think! That O.R.G. 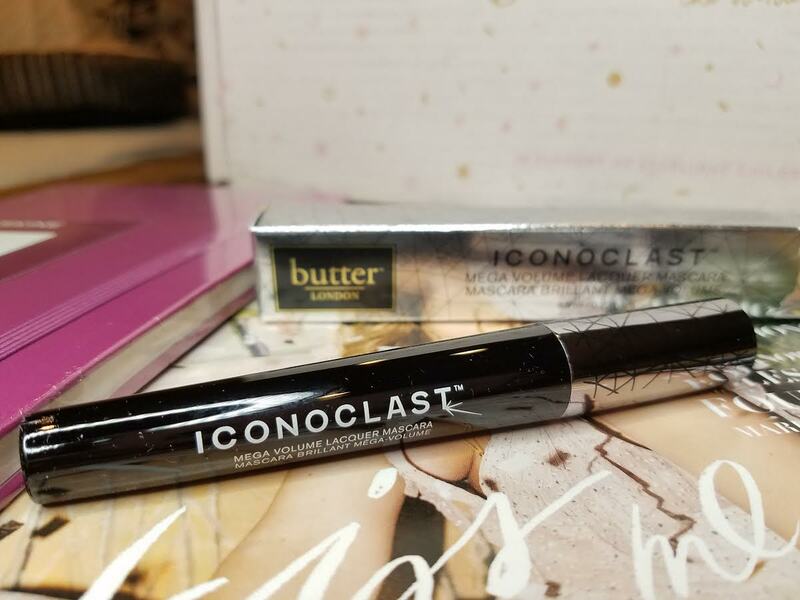 Skincare Peel is great and basically the same price as the box! Plus, of course, whichever extra you get! If Editor's Boxes are sold out, you'll start with the Spring 2017 box. I believe billing starts on March 5th for that box. When you subscribe it should tell you which box you'll start with. 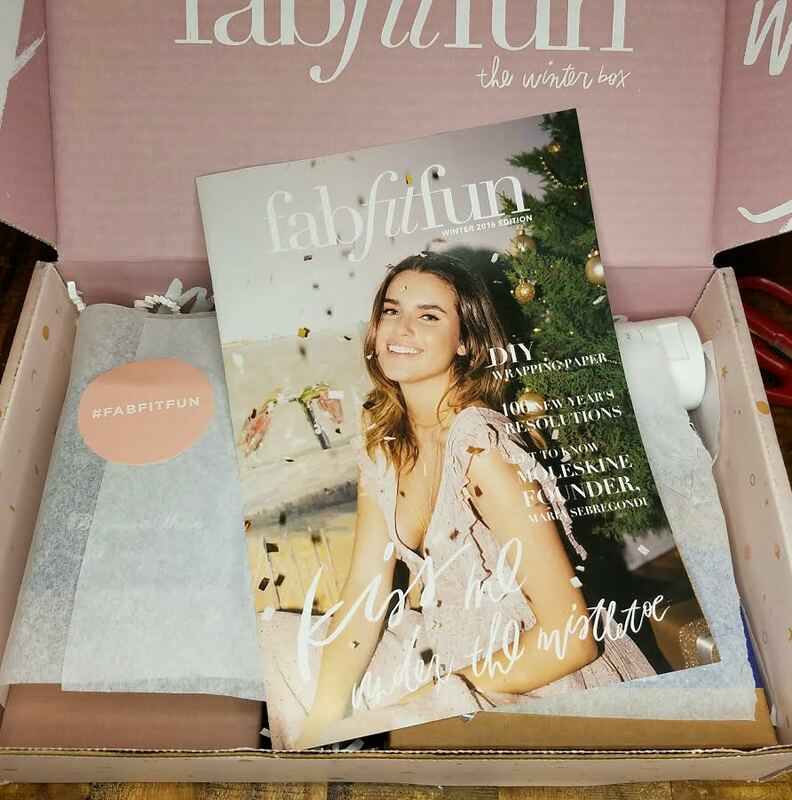 So sign up here for Fabfitfun and DO NOT forget your coupon code FAB10 for $10 off! That is an excellent point! No, it doesn't really. Or at least not on the West Coast. It's usually used more when drinking or I have started seeing it on letters as a closing. But, you're totally right, I bet that's exactly what it is!